Does the reigning Norm Smith make an appearance in your squad? He’s the reigning Norm Smith Medallist, end of article. Okay, so maybe that’s not enough to convince you. J-Jo was my pick of last season. He was beautifully underpriced playing for a juicy Fantasy-friendly side who, at that stage, were a chance to cause a stir come finals time. Now, of course everything played out a bit differently with J-Jo getting a long-term injury and missing Rounds 5-14, but we get to reap the benefits this season with Johannisen being priced AT LEAST 6 points less than what he should end up as, a 100+ average Keeper. I can’t heap high enough praise on this bloke, honestly, he is just that good and I’m not even a Dogs’ supporter. A combination of game-breaking pace, lethal foot skills, undying lust for the pill and destroying anyone who gets in the way of him and the Sherrin makes him a coach’s dream. Mix in a career kick to handball ratio of 2:1, 5 marks per game, and a massive ceiling of 144 (so far) and he becomes a Fantasy coach’s dream too! That’s not even close to being the end of the story. I mentioned his career kick-handball ratio. J-Jo also averaged just over 24 disposals per game in 2016, including a wondrous 16.6 kicks per game. *Fantasy coaches salivate simultaneously*. Add to that Johannisen’s scoring consistency: including finals he played 17 games; 6 of those were 100+, 9 were 90+, 13 were 80+ and, of the 4 that were below 80 he had 67 and 64 against Hawthorn, a team known to control play and shut down outside running, an injury effected 70 against Carlton and a 79 (so close) against the Saints. So, round up the 79 to 80+ and he scores poorly against one team and when he gets injured. I’d like to couple all of this with the fact that, and this is said with every limb of my body crossed and touching every wooden object in sight, Johannisen is no more likely than anybody else to get another long-term injury which should equate to even more consistency! Sprinkle on top that Johannisen was top 10 in the league for both kicks per game and bounces per game, and that makes him a top 10 run and carry player, right? No matter what, my main doggie is Fantasy gold and a must have. If he isn’t in every Fantasy contender’s team I’ll be astonished. Priced at $563,000 or 94.9 points, he’s the equal 9th most expensive Defender (equal with Bachar bloody Houli nonetheless) and he’s a lock for top 6 in my opinion. I can’t think of many reasons at all. 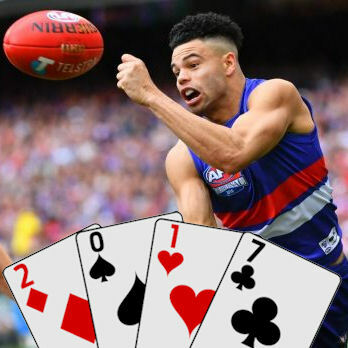 I can lock in Taylor Adams to average more than him, then it’s a scrap between Johannisen, Boyd, Docherty, Simpson and possibly Shaw, then you have Laird, Kelly, Joey and Vince. That’s without any of the DPP’s we’ll get. I personally have Johannisen equal second with Docherty, with Boyd only missing out because I think he will play a few less games this year. So, if you disagree strongly with my order, as in you have at least 6 players ahead of him, and you’re willing to spend $30k+ more to get one of those players, then don’t pick him. The only other reason to not pick him is fear of injuries but that’s just like picking any other player. J-Jo got injured in Round 4, came back in Round 15 and then played 13 games straight without any setbacks. So, for Johannisen to miss through injury would take a brand-new injury, therefore he has the same chance as anybody else to miss a significant amount of games through injury. This means that, unless you’re not going to have anybody at all in your Fantasy team, injury really isn’t an excuse not to pick him. Just pick him. Please. Or don’t but I’m confident you’ll regret it. Ace – Taking the whole of Fantasy into consideration, he’s probably a King. He won’t average 110+ but, unless Pendles (or someone similar) gets Defender DPP, no Defender will average 110+. In my books, a 100+ average as a Defender, the consistency he provides with his multiple ways of scoring, and the fact he plays for the best Fantasy scoring team in the league makes him an ‘ace’ Defender. How good will Jason Johannisen be at season's end? FOLLOW ME ON TWITTER: @Sparksy361 for all thing AFL Fantasy (and more). Got something to say about the deck? Use the hashtag… #DeckofDT. Him over Joey easily, I can see Joey losing midfield time and maybe even a few games to younger players. Montagna barely played any midfield time last year, instead playing a running role of half back. I would say he doesn’t have any midfield time to lose! Don’t mind it but Lloyd doesn’t quite have the consistency and he’s definitely not going to be Top 6 but he is a bit cheaper and could have a breakout year after that finals series. With Tom Mitchell gone, does he get more midfield time though? That’s the question along with Heeney in mids? Mills should be playing through the mid or Heeney but I watched last year and I’m assuming they need a smaller goal kicker in him. Jake Lloyd is a terrible kick. Makes a lot of decisions which are poor and sometimes it’s just luck… Bad luck. He causes a lot of turnovers. I’m really not sure J-Jo and Grizz Adams are all that comparable, he might lose a mark a game but Adams tends to play a lot deeper. He still averaged just over 90 with Bob in the team at the start of last season, I guess it’s a wait and see but I can see them both prospering! Sammy is 23, J-Jo is 24 but age won’t be a worry unless you’re talking about Keeper’s leagues. Either is a great choice, I probably expect Docherty’s average to be slightly higher but my boy here is almost $50k cheaper! If you don’t think this bloke is going to cop serious attention next year, you’re delusional. His combination of excellent ball use and metres gained mean that he will be just about the first player opposition coaches will look to get on top of. And just as we saw from Heath Shaw last year, even the best scorers can struggle when a defensive forward is played on them. You take J-Jo out and Suckling, Boyd, Adams, Murphy and Biggs all prosper. You can’t have more than one lock down forward in your team without seriously compromising your forward structure and scoring potential. I understand your concern but you don’t shut down several run and gun players by tags, you shut it down by a team defensive effort, zoning hard and picking when to man up. I’m sure some attention will be given to him but if they just focus on him the Dogs will burn them. Plus, have you seen how quick this bloke is? Name me one Defensive forward who performs consistent tagging roles who could actually stick with J-Jo? Also Eagles still having talls issues -giles? (but is dearer)-ruck backup? Great article Soarksy featuring one of the players involved in my toughest choice so far this season….J Jo vs Laird…I can’t split them…I have Adams and Doc locked as 1 & 2 in my defense with J Jo or Laird to fit in as my third premium/keeper in def…..After reading your article I’m now considering putting BOTH in and start with a stacked defence and utilise the value available in the mids this year…Eg. Barlow,Murphy,Heppell,Beams… Thoughts? I believe Laird has foot issues that could linger (could be wrong!) and Johannisen should outscore him anyway! But, I guess if you’ve got the cash and value elsewhere both isn’t a bad option! Cheers Soarksy I hadn’t heard of lingering foot issues with Laird but doesn’t surprise..His broken toe last season certainly hung round…. I appreciate he’s your boy and you like him but to say he’s just as likely to get injured as anybody else is delusional. The guy has missed 32 games in the last four seasons. That’s terrible, puts him in Beams category for durability. Kade Simpson has missed 6 games in eleven years for contrast. I like him and am considering but with Adams being such an injury risk I don’t think you can justify having both. He only tonned up 6 times, and scored in the 90s 9 times last year. So why are we expecting a 100+ average?? He’s a wonderful player, but I can’t see him averaging significantly more than the 95 he’s priced at. More to the point hes only had 3 100+ scores in H+A season jj his whole career. Lloyd had mire than that just in 2016. Think JJ is a massive risk, largely unproven, bad injury history, would prefer to spend money on a player with a consistent scoring record over a number of seasons. Would even question his Norm Smith Medal, give the amount of clangers. Currently have Doc in over him, but I agree he has to be up there for top 6 contention. He plays that dashing rebounder role and draws a lot of attention, that Norm Smith can only bring more, while he does win his own ball too that role always concerns me a bit because the shutdown is a really big possibility. With that said, I said the same thing about Hunter and Z Merrett all last year too and it just never came (It wasn’t a good year for me), and he does have Suckers back there with if anything an even higher profile as a devastating ball mover. Still, at any rate, Doc has that low key vibe to him which I really like, and Simmo stands out to me as a player who really thrives off those uncontested marks (Thus the 20s when anyone sits on him), so even if the Blues become less of a cakewalk I don’t see him ever being in danger of being shut down. I have Doc over JJ too. Not sure of JJs role considering re-re-shuffle of the backline at the Dogs. Will monitor tho. Recently traded out Stef, Heppell, Myers and brought in Witts, Titchell and O’Meara. Tried to be slightly more unique.